Crunchy caramely goodness. This cereal mix is perfectly delicious for snacking. It is sweet, salty and quick and easy to make too! My Aunt Jenny is famous! She submitted this recipe to Gooseberry Patch and had it published in Homestyle in a Hurry. Isn't that fun? 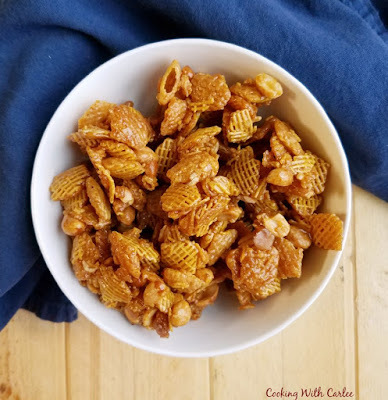 If you liked Grandma Schanhorst's Microwave Caramel Corn, you will love this! It is the same principle of making a caramel and using the microwave to dry it out. It is so much quicker than using the oven! We threw together an impromptu BBQ this weekend. It was just too nice not to cook something over fire. Now, when I say cook something over fire, I really mean it. My husband cooks over a wood fire. He starts with logs and paper and kindling and the whole bit. So, it takes a while before we are ready to cook. He has to make the kindling, build a pretty little fire (sometimes he gets pretty artistic with his wood placement), start the fire, feed the fire, burn the fire down a bit to get a nice bed of coal. Finally, a few hours later we are ready for the food. So, needless to say, the process can make us all hungry! It just so happened I had bought the cereal to make this. So, I ran inside and made a little snack for everyone while we waited for the fire master to do his thing. Make sure you have a large glass bowl ready for this. My 4 qt glass bowl is just barely big enough for to make a full batch. You are going to want to use glass because it is microwave safe and you don't want that super hot sugar burning into anything else! Jenny also shared her Feta and Spinach Stuffed Chicken Breasts with us and they instantly became a favorite dinner here. We highly recommend them! Snack mixes are always so much fun to make and eat. They are perfect for parties. This is a favorite and so is the Brownie Batter Puppy Chow. 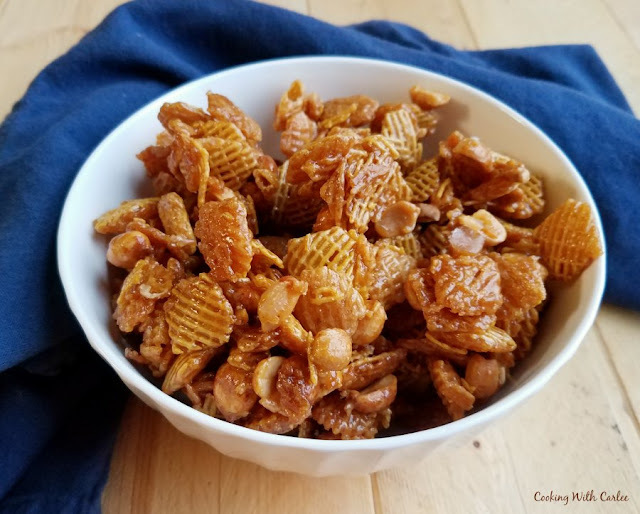 Now I am curious, do you have a favorite snack mix? Crunchy caramel-y goodness. 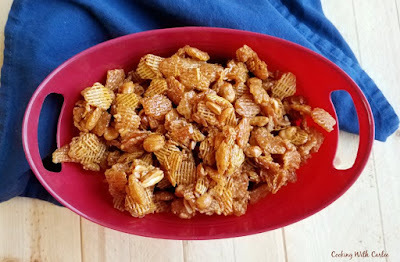 This cereal mix is perfectly delicious for snacking. It is sweet, salty and quick and easy to make too! Microwave on high for 2 minutes. Remove and stir. Repeat two more times. Well this sounds like it could be dangerous and addicting! Yummy! Oh my goodness, it is! Our kids like to snack especially salty snacks. This looks like it's easy and yummy, too! My little guy loved it! It was so quick and easy too! Thanks for stopping by. This looks so good, I can see how it would be addictive! Thanks for sharing at What'd You Do This Weekend? I hope you will join us again this Monday! It's terribly addictive! My little guy had his own little bowl of it, but kept trying to reach into the big bowl on the table anyway. None of us could stay out of it! Wow, what a nice snack...Jenney's Smacky Delicious Mix looks and sounds great. Thank you for sharing with the Clever Chicks Blog Hop! I hope you’ll join us again next week! It is dangerously good! Thanks for hosting. Too funny! 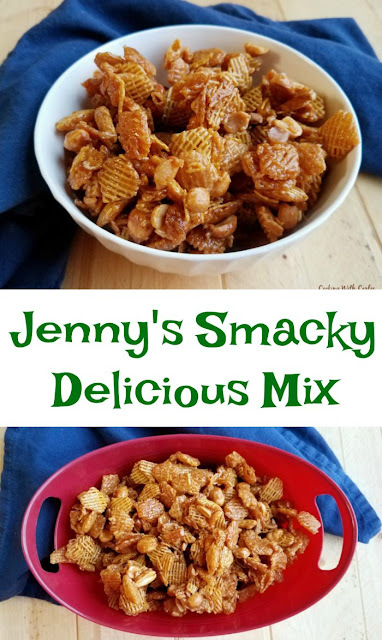 We love snack mixes that include cereal and they are so easy. Thanks for hosting! Sounds like a fun BBQ, and the perfect snack to tide you all over! Thanks so much for sharing at Talented Tuesdays! My husband and I have very different entertaining styles! His are last minute and whatever ends up on the table is a surprise to everyone. Mine area bit more planned. The snack mix worked really well to make sure nobody starved in the process! Yummy! Who doesn't like a good snack mix? Thanks for sharing this awesome post at Totally Terrific Tuesday Link Party. If you haven't linked up this week, be sure to stop by. The party is still going on! Enjoy the rest of your week! Thanks, Christie! We anything snacky around here, so this was no exception! Oh this would not last long around me or my house. Might be making this soon but that would blow my diet. :))) I like cooking over fire when we go camping. Love the flavor adds to the meal. Probably not good for us though. Thanks for sharing with us at Throwback Thursday. Can’t wait to see what you bring this week! It does add a great flavor to whatever you are grilling... and it has be still be better than frying, right? Well you have to have your priorities straight ;-) Thank you so much!